Following-up on a heart-breaking story that we reported on last month. 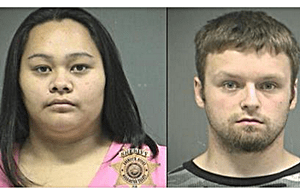 An Oregon woman and her boyfriend who stood trial for the murder of the woman’s 4-year-old son whom she killed because she believed was gay has been found guilty and sentenced to life in prison. Jessica Dutro’s son Zachary died in August 2012, days after collapsing at the homeless shelter where his family was living southwest of Portland. In a Facebook message read in court during the trial as evidence, Dutro had written to her boyfriend that her son, Zachary, at the time was “facing the wall” because he had made her mad. Canady would have to “work on” Zachary, she wrote. The message established Dutro’s motive for inflicting a pattern of abuse, prosecutor Megan Johnson said. Dutro assaulted three of her children, but Zachary received the harshest treatment, authorities said. Doctors concluded that abdominal trauma had caused the tears in Zachary’s gut. High-velocity car crashes or bike accidents could cause similar injuries, [Dr. Danny] Leonhardt said. Otherwise, it takes forceful, violent kicking or stomping to cause such injuries, he testified. Bruises were all over Zachary’s body. They suggested that the child had pulled himself into a fetal position to protect himself from a beating, the doctor said. The various injuries indicated he had been abused multiple times, Leonhardt said. Old, dead tissue from a deep cut hung off of Zachary’s lip. Leonardt, a child abuse specialist at Randall Children’s Hospital and CARES Northwest, could not recall another case where a child had that injury. The doctor said most children with such a wound would have been brought in for emergency care. There is a special place in hell for Jessica Dutro.